We're In The Paper... Again! Make sure you pick up your copy of the Romford Recorder this week. 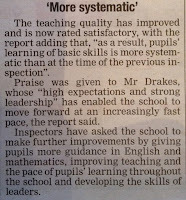 Following our positive Ofsted report before Easter, the paper has run a story on the improvements made at the school so far. However we are not finished yet... not by a long way. Without a doubt we will not be satisfied until we achieve at least a good grading at our next inspection. 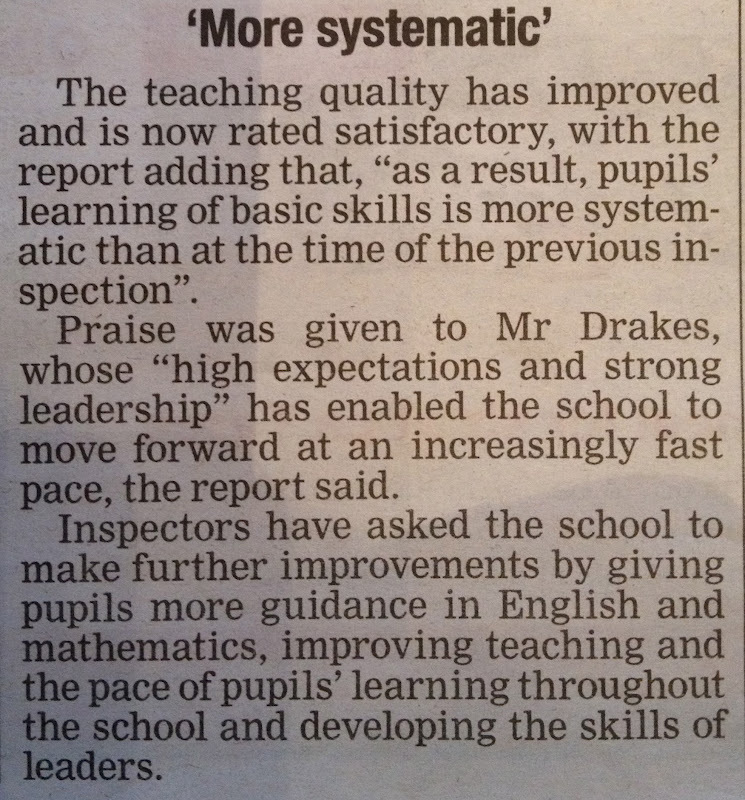 The support of all our school community has been and will continue to be critical in achieving this progress. Last night (Sunday 29th April) Sophie had the amazing opportunity to dance at the Royal Albert Hall. 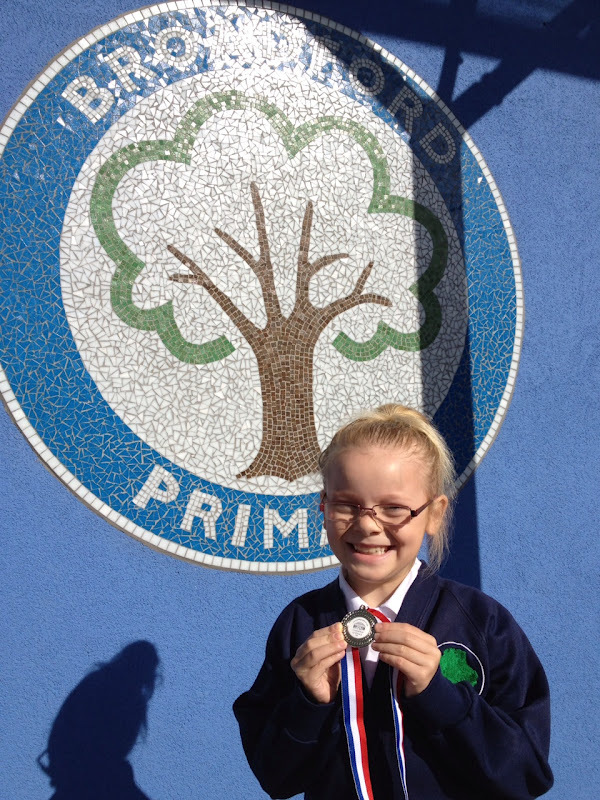 At Broadford we are blessed with some very talented children... well done Sophie! "We went up there on a coach - which took us an hour! When we arrived the venue looked like a castle... I felt very nervous. Watching our performance were 3,000 spectators including: my Nan, my Grandad, Auntie Val, Uncle Jeff, Mum and Dad. For the routine we had to wear a pink, white and blue costume. The dance lasted for about 15mins. At the end everyone (6,00 hands) clapped loudly... very loudly! Normally I go to the Starshine Dance club - which is run by Mrs Edwards. Tuesday and Thursday are our practice nights. It was a lot of fun and I would love to have the opportunity to do it again." On Wednesday we welcome in the parents of Willow class for their latest sharing assembly. Last week we were entertained and educated by Ash. Did you realise quite how incredible the achievements of Boudicca were? Their topic on Invaders and Settlers certainly seems to have been very interesting. If you haven't had the chance to visit yet, make sure you come and look around the book sale in the old hall. It is open after school and represents great value: all books are half price! You can come and look at 3.15pm on Monday 30th April and Tuesday 1st May. The books go back on Wednesday. Entry to the sale is through the back doors of the old hall - directly off the playground. Please bring change as it is not always possible to change large notes. To further support the work done on road safety with Year 5&6 and Year 1&2, this week we welcomed another theatre group to the school. This time the actors took a different approach with the theme. The Swag Bag Gang clearly demonstrates the dangers when crossing or playing near a road and the consequences of not wearing a seatbelt. The audience are transported to the scene of a crime were they investigate a series of catastrophic events. With slap slick characters, and an exciting plot the actors performance is fast, funny and very powerful. Register Your Thoughts on Parent View! 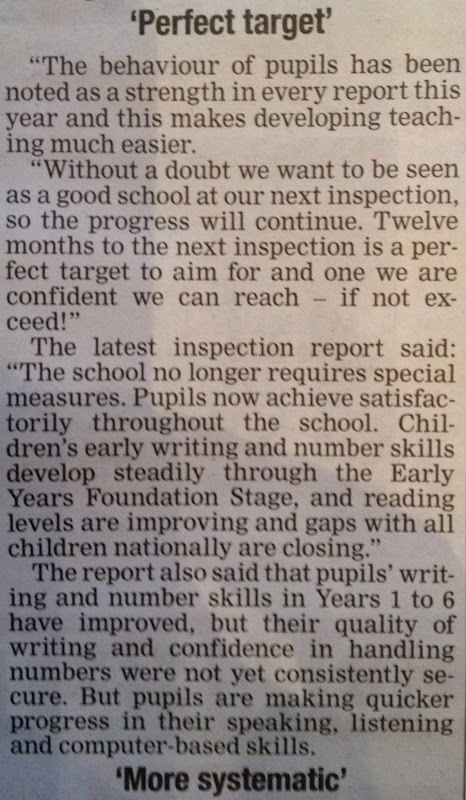 During the latest HMI Inspection, the inspectors were very pleased to see how we currently offer parents the chance to comment on how our school is improving. Ofsted's new Parent View website gives you the chance to tell both us and Ofsted what you think about Broadford Primary school. The Parent View survey asks for your opinion on 12 aspects of our school, from the quality of teaching, to dealing with bullying and poor behaviour. We will use the information you provide to help us improve. Ofsted look at the website as well as a tool to inform them when making decisions about which schools to inspect, and when. By sharing your views, you’ll be helping Broadford Primary to further develop towards being a good school. You will also be able to see what other parents have said about our school; or, if you want to, view the results for any school in England. In order to leave your thoughts, you must have registered with Parent View. This survey is not designed to receive complaints about our school. If you wish to make a complaint or have a serious concern about Broadford Primary, you can find more information about how to do so on the Ofsted complaints page. However we do operate an open door policy and would hope that any concerns could first be resolved by you coming into see us and talk it through. We look forward to hearing your ideas and views. 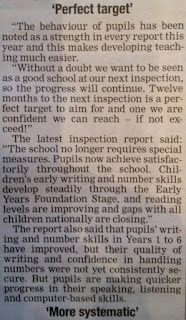 Working together we have every chance - in the next 12 -18 months - of making Broadford Primary a good school and 'the best school on the hill'! KS2 class Birch have retained their ‘best in KS2’ status with an attendance of 96.9%. In KS1/EYFS class Fern achieved 97.4%. Hats off to both of those classes. Congratulations to Taylor Barnfield & Richard Gilheney who excelled in their Read Write Inc sessions this week. These wonderful children have demonstrated excellence this week. Congratulations to this week’s winners! We are pleased to inform you that your child’s school is to be included in a Debit/Credit Card payment system for School Meals, via our Head Office. Debit/credit card details (a small charge is made for using credit cards). You can choose whether you will collect your tickets from the front of the ticket line, or whether they may be sent home, in a named-envelope, via your child’s book bag. (Obviously if you opt for your child to bring the tickets home, the tickets become your responsibility and any lost tickets will not be the responsibility of the caterer or the school). The Debit card hot line number is 01708 433119, and will be open from 9.30am till 3pm, term-time only. Dinner tickets will still be available for sale (using cash) on Monday and Wednesday mornings (8.15-8.45) from the School double doors at the bottom of the pedestrian pathway. If you have any questions regarding this payment system, please contact our catering office on the number shown above. Today saw the Havering Schools Basketball competition - which was hosted by the YMCA. Led by Mrs Higginson and Mrs Byrne, the children had high hopes of competing well in the group. Dribbling, shooting and passing skillfully the children made short work of Scotts in their first game. Afterwards there was a physical encounter with a strong St Joseph's team. However the children did not let it bother them and they bounced into the final match. Unfortunately Parklands were just to quick and it was difficult to win the ball back. Without a doubt the children performed brilliantly and enjoyed the competition. Well done to the Broadford Bulls! In our Nursery this week the staff and children had a great day learning about St George and the tale of the Princess & the Dragon. First Miss Hopwood, Mirs Light and Mrs Chisholm dressed up to reenact the famous tale. Afterwards the children made a delicious cream tea. Fighting dragons makes you hungry didn't you know? One of our Key Stage 1 pupils had the amazing honour of being allowed to carry the flag during the recent St George's Day parade. Striding proudly through streets Holly did a great job of representing her Beavers troop. Outbreak of Green Finger @ Broadford! Tuesday saw the launch of our new gardening club - which we are very excited about. Staffed by Mrs Chiswell and Miss Rutherford (who are being very ably assisted by Mr Seabrook....) the club is charged with taking care of the flower beds at the front of the school. Armed with trowels, spades and rakes the children made quick work of clearing the weeds. Before long there was a very competitive worm spotting competition taking place. Samson found an absolute monster... but they left it alone to get on with aerating the soil! Over the next few weeks the children will begin to plant all the beds so that we will soon be enjoying Broadford in Bloom. Well done everyone, the work so far looks fantastic. This week, the attendees at Performing Arts Club, led by Miss McGuinness, Miss Rutherford and Miss Reynolds, were given scenarios from famous fairy tales or nursery rhymes and given alternative scenarios. The poor Wolf (played by Patrycja) from The Three Little Pigs was no longer big and bad, as he had lost his huff and puff. Snow White (played by Bobbi) had her work cut out for her when the Seven Dwarfs came down with a nasty case of chicken pox, and Humpty Dumpty (played by Connor) had a modern day twist with a gangster personality and a sudden new found sense of balance. The children all performed to one another and are brushing up on their acting skills in preparation for another outstanding performance later on in the Summer. This afternoon, our attendance champions from last term had their trip to Kidspace in Romford. Ash class had an entire afternoon of jumping, climbing and sliding their way through the adventure trails to victory. A fantastic time was had by all and they are now even more determined to win the attendance award this term and ensure that they remain undefeated. Events next week & news update! Myplace Harold Hill is launched! Kitchen Gets 5 Star Hygiene Rating! Cakes & Drinks For The Blues! Horrible History Facts - Tudor Deaths!